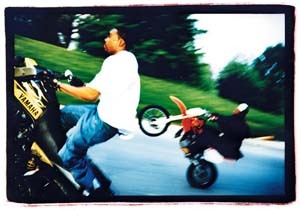 A 2003 Baltimore City Paper feature about the young men who take their (illegal) motorcycle shenanigans to the city’s streets every summer. Photographer Jefferson Jackson Steele and I rode along with the Boyz, and got some great shots. It’s a cool spring evening, and Druid Hill Park is jumping. Cars and motorcycles are parked all along a narrow road near Latrobe Pavilion. Everyone’s hanging out by their rides, listening to car stereos and chatting up their neighbors. The road itself is jammed: freshly washed cars, SUVs, and motorcycles, all going back and forth, up the road to the basketball courts and down to the statue of George Washington. It’s the kind of slo-mo cruise you’d find at any decent beach, except here the nearest body of water is the reservoir at the bottom of the hill. The distinct high whine of a two-cycle engine calls from the other side of the reservoir, along Druid Park Lake Drive. It’s a dirt bike. First one, then another, then a dozen or more young guys on motorcycles hit the park, weaving along the cruise route and zooming across the grass. The weekly Sunday gathering is hardly quiet, with the sound of the hornetlike motors cutting through the crowd, yet the roadside gauntlet erupts with laughter and shouting. The 12 O’Clock Boyz have arrived. One rider hits the circuit, leans back on his Honda CR85R, and pulls the front forks high into the air–popping a wheelie. But Wayne, the rider, holds the bike this way for a good stretch of road, turning the handlebars slightly to keep balance and gently nudging the throttle to keep his speed and position in the queue of cars around him. He hits 12 o’clock–vertical, nearly 90 degrees perpendicular to the pavement–and scrapes his plastic back fender. A few “Yeah!”s and “Goddamn“s fly up. But it’s hard to hold, in this stop-and-go traffic, so Wayne drops the front end and cuts to the shoulder, where some of his buddies idle. Pee Wee’s not far behind. He has a little more open road before him, so he’s comfortably 12 o’clock on his yellow four-wheel Yamaha ATV, his 5-year-old daughter nestled in his lap. One hand’s on the throttle, twisting in quick, herky-jerky bursts that elevate the motorcycle when it starts to flag. The other hand is in the air, a steady fist that punctuates the stunt. He scrapes his fender. Within a half-hour, the group has gathered on the empty promenade along the reservoir, down the hill from the pavilion. Nearly 20 dirt bikes circle the stretch of pavement, each guy taking turns going vertical. Guys on ATVs whiz by, their legs outstretched in an almost balletlike display. A moped goes vertical, looking more like a begging, squat-legged dog than the more elegant beasts that pass him, but the rider gets plenty of cheers. Then the party breaks up with a couple shouts of “Five-oh.” Sure enough, a police cruiser, blue lights flashing, has stopped at the top of the hill. Half the crew zips off to meet on the other side of the park, white exhaust smoke wafting into the young green foliage. The remaining bikers wait it out. With the warm weather, it’s like this all the time. Summer is fast approaching: When snoball stands break out the marshmallow pumps and ice-cream trucks endlessly loop that electronic “Turkey in the Straw” tape, the dirt bikes come out of storage. Follow the drone and smoke trails along North Avenue, Reisterstown Road, wherever, and you might catch a glimpse of the 12 O’Clock Boyz. Young guys have ridden dirt bikes on city streets for years. For many Baltimoreans, it’s an annoyance. It’s definitely illegal. Though police are instructed not to chase the bikes after a number of hot-pursuit accidents, there are still confrontations. It’s also dangerous, with or without police chases. A kid on a dirt bike with no helmet against a truck–guess who wins? There have been a handful of fatalities in the past few years, yet hundreds of local teenagers and young men take the risk. But the 12 O’Clock Boyz aren’t your ordinary dirt bikers taken to asphalt. Their numbers are small–they estimate 15 to 20 core members, with plenty of tagalongs. They laugh at the guys who ride dirt bikes in the woods or on trails–they call them “wingworms,” which is “a better word for a dirty person,” Pee Wee says. They stick to the streets and the parks, looking for places to ride vertical, practice their form of motorized ballet, impress the crowd–especially the girls–and try to avoid the police. Nor are they into speed, like the street racers–the Boyz prefer urban acrobatics. The idea is simple: Take your dirt bike, learn how to pull back the handlebars and stay there. You’re at 12 o’clock. A scraped fender gets a cheer. Find ways to balance and move around on the bike. Be elegant, be flashy, but don’t look like you’re trying too hard. “It’s just balance and control,” a biker called Moe-Town says, belying the amount of practice it takes. It’s another spring day; clouds and a threatening storm keep most of the 12 O’Clock guys home. A few have shown up to ride a stretch of Reisterstown Road for the benefit of a group hanging out in front a car wash and a photographer who’s shown up. After a half-hour of pulling stunts, a police cruiser arrives. After the cruiser rapidly backs off the curb, nearly hitting Pee Wee’s ATV, he and the cop exchange harsh words. The bikers dissipate. Pee Wee returns all fired up. The cops should leave them alone, Pee Wee, 27, says. “I’m not doing any drugs or any alcohol. . . . When’s the last time you saw a bunch of black people, smiling, without any guns, drugs, or alcohol?” Pee Wee defends his sport, and motorcycles in general, which he and his fellow 12 O’Clock Boyz say is a good outlet for kids in a city that offers few recreational choices. He goes on to list library closings, the lack of basketball courts, dwindling rec centers, the temptation of drugs and alcohol, and the crime that goes along with them. “There wouldn’t be any bodies if you let these kids ride bikes,” he says. Moe, 27, echoes the sentiment, saying there’s just not enough stuff for kids to do. “Not everybody can play basketball or get into music,” he says. Pee Wee and Moe-Town produced a video in 2001 that captures many of the 12 O’Clock Boyz performing stunts and cutting up for the camera. They’ve just finished a second video, which they hope will further publicize their group. Don Diva magazine recently filmed them for an urban-lifestyle documentary, and the Boyz have been invited to participate in a new motorcycle stunt show called Baltimore Bike Blast, slated for the M&T Bank Stadium parking lot in July. The show is scheduled to feature the motorcycle stunt groups the StarBoyz and the Ruff Ryders. But until then, the show goes on whenever the Boyz hit the streets. The following Sunday at Druid Hill Park the Boyz are back. Their numbers are fewer, but they ride the gauntlet as usual, provoking shouts and cheers. Down on the promenade, a couple of dirt bikes whiz back and forth. One guy is giving younger kids rides on his ATV. He’s going pretty slow, but they love it. After each of the four kids takes his turn, he hops back on his little motocross bike and tries to hit 12 o’clock. Someone suggests they take off their front wheels, to help the balance, but they laugh it off.